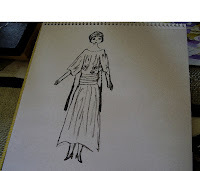 The great dress-designer, Poiret, revolutionized women’s dress in the early years of the twentieth century. He liberated them from their restricting corsets and designed free-flowing, comfortable dresses and tunics. He also established the first designer perfumes and linked interior design with his other businesses. The couturier’s determination paid off. Encouraged by his friend, Dr. Midy, who owned a pharmaceutical laboratory, Poiret established his own at his house in Paris. He named his new perfume business after his daughter, Rosine. He also named his interior-design business after another daughter, Martine. Later Poiret added soaps, powder, talc and makeup to his business. suitable to her taste.” Poiret enlisted his artist friends who included Lepape and Dufy to help him with marketing and design. His other business, Les Ateliers de Martine, usually supplied the packaging. An example of one of his lovely perfume bottles is the one created for the scent, Chez Poiret. Made of clear glass, this had a colored stopped and a golden tassel. The label had a classic ‘R’. Poiret thought that the marketing and presentation of his perfumes was so important that he remarked that he wanted each flask to be: “ a carefully considered art object so as to be in total affinity and complete harmony with the perfume it secretes.”. One of his innovations was the famous ‘Rosine Handkerchiefs’. This involved each perfume bottle being enclosed in a little square of checked material. Poiret’s advertisements were very simple, modern and clever. He also used fans to advertise his fragrances. The perfumes were so successful that the famous Coty, head of another perfume enterprise, attempted to take it over. Unfortunately Parfums de Rosine ended because of the stock-market crash. Although Poiret’s perfumes are unavailable, in 1991 Marie-Helene Rogeon decided to re-establish her own version of the exquisite fragrances. Rogeon was born into a family of perfumers. Her ancestors worked for Poiret and one created a cologne for Emperor Napoleon III in the nineteenth century! Her passions include perfume and roses so she decided that establishing this business was a good way to combine her twin loves. She asked perfumer, Francois Robert, to create her rose-based scents which include La Rose de Rosine and Diabolo Rose.